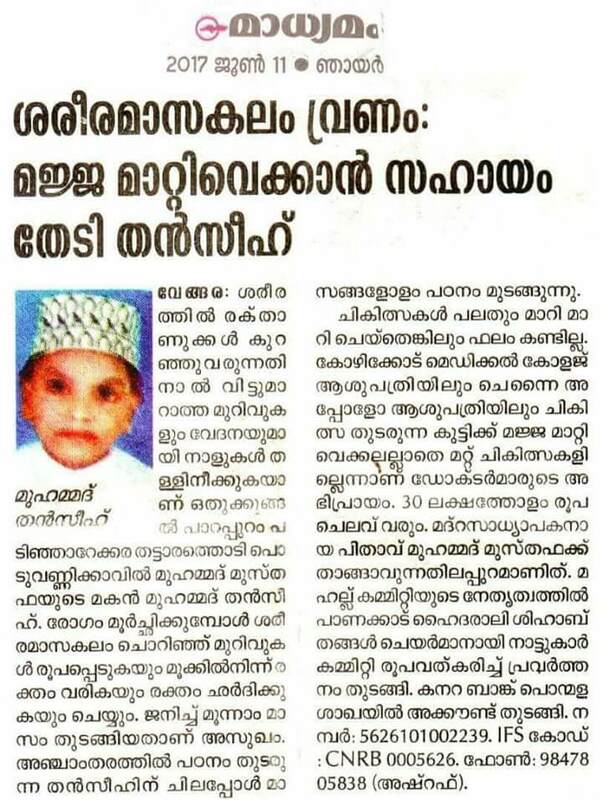 Muhammed Thanseeh, only 10, son of Mustafa Thottarathodi Poduvannikkavil who belongs to a remote village Othukkungal here in Malappuram District, Kerala, has been going thorough most perilous condition of his life. 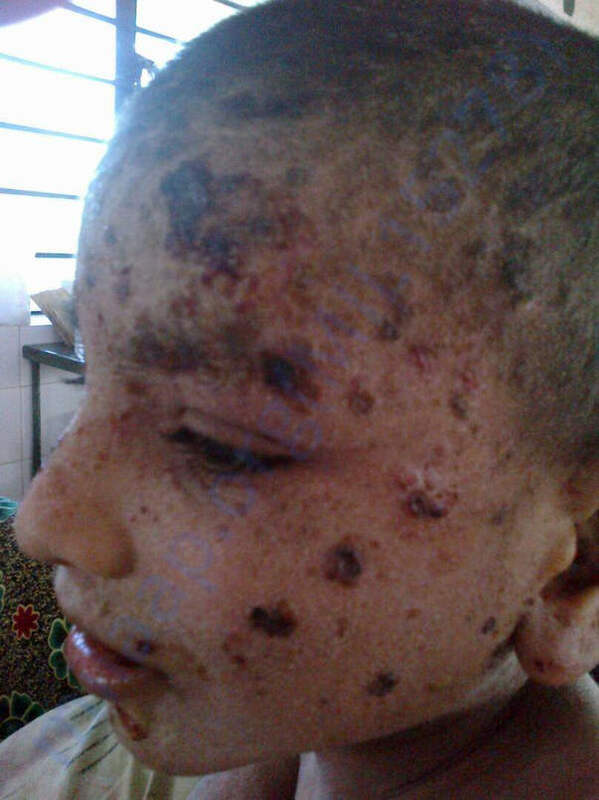 Due to the lack of corpuscles in his body, he has been suffering constant wounds in his body caused by strong itching and severe pain throughout the body. Sometimes when it gets strong it is looking terrible, itching which he never stops and turns to big wounds, bleeding from nose and often vomits blood. We can’t even imagine the kind of pain our Thanseeh is going through. In some occasions, he can’t even talk but crying. When he completey loses his power, looks drained out, inactive, and doesn’t want to wake up, that is when we know that the disease is getting worse. Seeing his pathetic condition parents and other relatives are quiet helpless as they could only cry beside him. 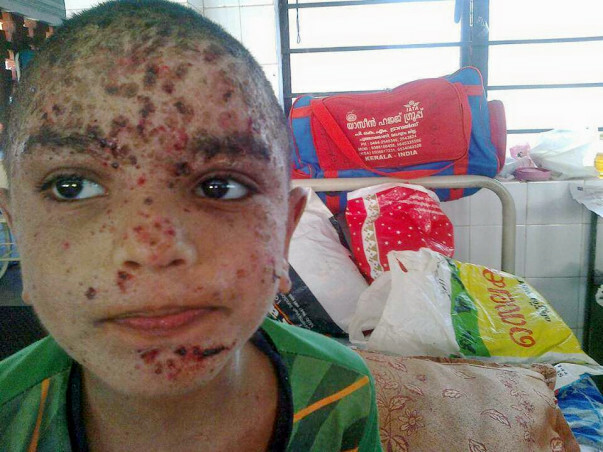 This incurable disease caught him when he turned 90 day after he was born. Though he underwent a lot of treatments and surgery but resulted in vain. Thanseeh, now in fifth standard, can’t pursue his education and compelled staying home for months. Even though several treatments and surgeries were done but it resulted nothing. According to Dr, Revathiraj, Chennai Appolo Hospital, and other eminent doctors from Calicut Medical College, it is Wiskott-Aldrich Syndrome (WAS) by which his body being wounded. Finally, after plenty of treatments failed, doctors suggested his family to make him undergo bone marrow transplantation surgery as there is no other alternative solution. The surgery is to be expected about 30 lakhs which is beyond his family’s means. 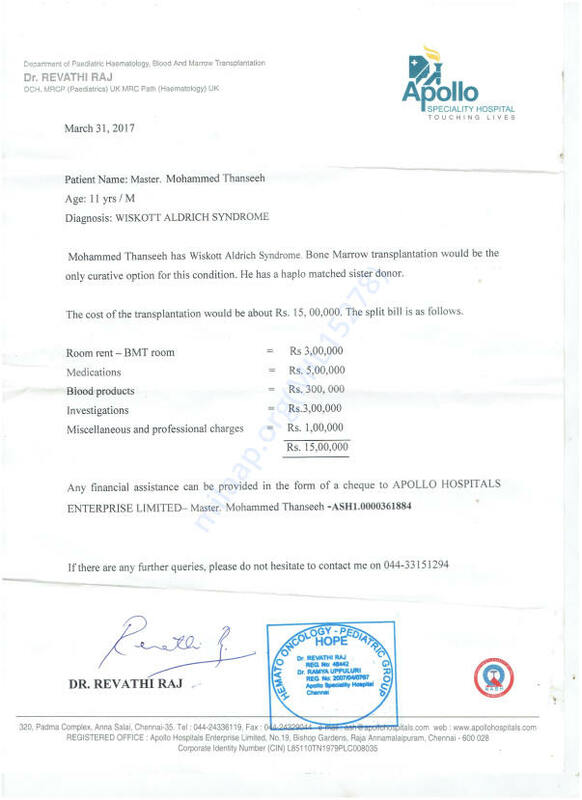 For several times, his family has spent more than 5 lakhs for his treatment who is currently being treated in Calicut Medical College. According to his father Musthafa, who works in Madrasa for cheap salary, the amount of surgery is too big; this is never to be accumulated by him. To save his life the whole native people has joined their hands and has formed a committee under the leadership of Mahal Qazi Sayyid Hyder Ali Shihab Thangal, Kerala state president of IUML. Also people from our community in Malappuram and Kozhikkode are crowd funding to help us, so we are trying to raise the half of the amount. We hope your benevolence, kindness and wholeheartedly support for our beloved Thanseeh. It is extremely depressing for us to see our Thanseeh like this. We are broken-hearted thinking about what might happen, but right now all the flurry of work around the transplant is keeping us distracting from the terrible thoughts. We think this transplant surgery will give him a pain-free, healthy shot at growing up and living a happy long life. Dear All, hope all of you doing well. I would like to call all of you “My brothers and sisters” rather than donors. Now it is the time of happy and relief. We (the family of Thanseeh, for whom you all donated) are in immense pleasure to let all you know that we are about to go to Apollo Hospital for our boys bone marrow transplantation, Thanks God. Firstly we thank and appreciate all of you dear brothers and sisters for you valuable and precious donation toward us. Even without any queries and asking doubts about this news, you all came forward to help us, we don’t know how to thank all of you. The best we can do for all of you is to pray for you and your family knowing these oral thanks never equalize your support and blessings. May God bless you and give you happiest life. In the list of supporters there are very less I know them, the majority or 99% people are unknown to me, but you all made it happy and merry, Thanks all of you. I have done my best to let all you know the updates and other details regarding this issue, if not please pardon me. Also, I believe that I have done my best to send back an email to you once I received the donation from you. Doesn’t matter the size of your donation whether it is big or small amount, we convey our wholehearted thanks and credits from our deepest heart. Some of you I could recognize by name while others seen as “Anonymous”. Whether it is anonymous or identified, we are all with you praying for your prosperous and successful future. Above all, it would not be fair if I don’t mention the name “Milaap, caused to reach all of you. We have seen a lot of websites and other organizations working for their own benefits, but Milaap has introduced us how to use the internet and social media to help others and be guardian to the needy. If Milaap was not here, this would have been different. Big salute and applause for Milaap and its whole team for their help and they stood with us whenever we needed them. It is noteworthy to mention that Milaap team was very active and energetic to help us, moreover, I heartily congratulate that team who kept online and replied with valuable information and other techniques required. Though we couldn’t achieve the target amount 1500000, we are much excited and satisfied. As it was mentioned in the story that we had formed a committee for the collection of funds from our areas, by the grace of Almighty God we could collect considerable funds from our native people and those living expatriates in abroad. Now the fund has reached the target. The family of Thanseeh will set out to Chennai in coming days, very soon. Now we could see happiest faces and glorious eyes in his family. We will keep you posted. Thanks God, Thanks Milaap, Thanks my dear brothers and sisters. Thanseeh's platelet count is on a reducing trend and he is receiving regular blood transfusions. He is being administered treatment at Apollo and the doctors suggest that the only treatment possible is a Bone Marrow Transplant. As per the doctor's advice, the date of the transplant has been fixed for 12th August. His elder sister, Thasreesa will be the donor and she will be hospitalised tomorrow to undergo the pre-operative treatment. So far we have raised ₹10 Lakhs from our community in Malappuram and Kozhikkode and ₹7+ Lakhs on Milaap. Would request you to please share this campaign further with your friends and family. Thank you for all the love and support so far. Please do pray for his health. Here is an update regarding Thanseeh's health. He has visited almost all the hospitals in and around Kerala and the only solution was found in Apollo Chennai. He is currently at home and the doctors have suggested that the only solution is a bone marrow transplant, they are still looking for a suitable donor. The doctors suggest that we can start with the procedure only after at least 50% of the funds have been raised. Over the days his health has not improved and all the remedies that they have tried are just temporary and last for only a day or two. The local news paper (Madhyamam) has reported the issues of Thanseeh's campaign. Please do share this further in your circles. We thank you for all the love and support. God bless you. Wish you speedy recovery brave soul ! !